@craw_advantage yeah, it's not a game changer, just something I thought people might miss and that has an interesting new effect. 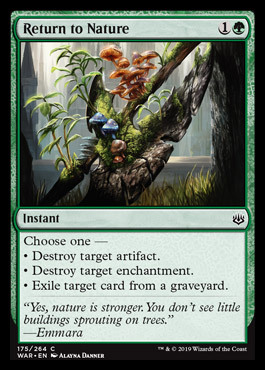 So, an upgrade to Naturalize that has an extra advantage over Nature's Claim. Even with Misstep, Naturalize never saw play over Claim. Is removing one card from the graveyard good enough to change this? Probably not, right? I mean, taking 1 card from Dredge does nothing, Reanimator is not a thing in Vintage, Oath doesn't use Snapcaster and Shops doesn't use Crucible. I think the only reason left would be to eventually counter a Snapcaster in PO, but you're not bringing Claim against PO, are you? Anyway, I think it's a good card to note and know exists.